And our Madame Yum is doing the projections for this fabulous show. Its all graveyards and windy outcrops and birds - crows, bats, harbingers of death. Kat put this show together for her mum who died a couple for years ago. It has resonance for me as I lost my mum last year. Love your mums! Let's talk about it, cry about it, laugh about it, make art about it. Death. Our collective yet predominantly ignored destiny will be faced and embraced using a multi-media theatrical fashion parade. 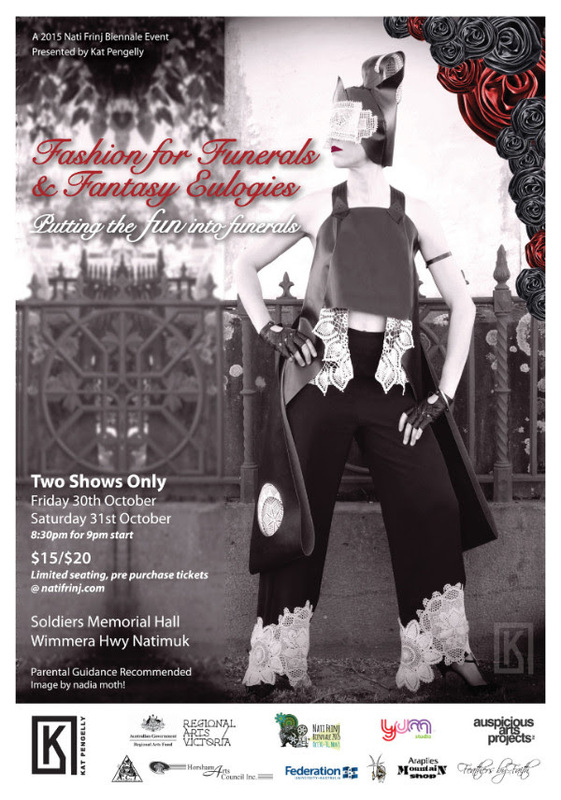 Fashion for Funerals and Fantasy Eulogies - Putting the FUN into Funerals is a story telling platform for writers', film and theatre makers, fashion designers', artists', psychologists' and scientists'. Bringing death to life by creating a cultural shift in the way we grieve that makes our inevitable end accessible and acceptable. This project was made possible by a Cultural Projects and Skills Development Grant provided by the Regional Arts Fund. The Regional Arts Fund is an Australian Government initiative supporting the arts in regional and remote Australia, administered in Victoria by Regional Arts Victoria.